This organ was originally built in 1941 by M.P. Moller. Through the years it was enlarged several times. Each project increased the complexity of the wiring, winding and mechanics. 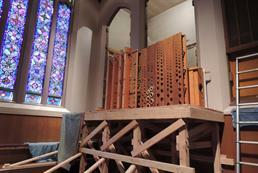 Although releathered not long ago, the leather failed quite dramatically, silencing the organ. Rather than rebuild the complex Great Moller windchest (originally a complex duplex action), it was decided to replace all the Great windchests. This not only simplified the winding and wiring, it also located all the Great pipes in a compact area. The leaking Great expression shade motors were replaced with two small electro-servo motors. These, plus an additional south set of expression shades, provide greatly improved sound egress. 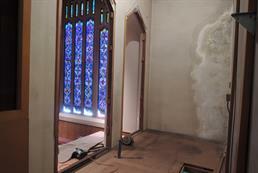 The Great Organ chamber space received repairs, painting and new LED lighting. Previously we installed a high-pressure 8' Gabriel Trumpet and 16' Bombarde (10" pressure).